Many species of bird travel north and south along flyways between seasonal breeding and wintering grounds. 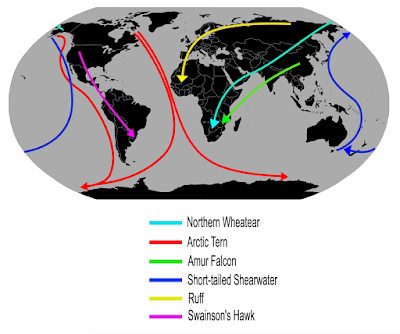 Bird migration was recorded by Homer and Aristotle 3,000 years ago. Seasonal migration is driven by the availability of food and by the suitability of nesting sites. Arctic Terns makes the longest yearly journey, flying from Arctic breeding grounds to the Antarctic. The Southern Royal Albatross circles the Earth over the southern oceans. The Sooty Tern spends months at sea before returning to land to breed. Migration is often arduous and carries the existential threats of predation and mortality. with the bottom dropping out. the sky beneath the sky of all. In Flight, Jennifer K. Sweeney, 24 May 2013.